Robert Le Hunte knew exactly what he was signing up for when he accepted Prime Minister Dr Keith Rowley’s request to helm the Ministry of Public Utilities — it wasn’t going to be easy, but he wasn’t about to let it deter him. “I think the job is living up to my expectations of a lot of challenges. 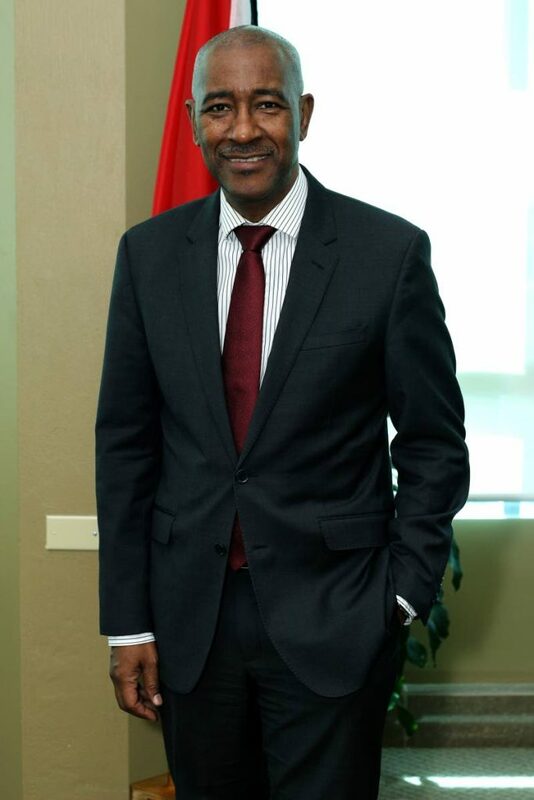 I made a pledge to the people of Trinidad and Tobago that I will give it my all and will use my God-given talents to bring leadership and authenticity to what I do and say,” Le Hunte, 55, told Business Day last Friday in an interview at his office at the Ministry’s headquarters in St Clair. He is adamant that leadership — and the personal responsibility inherent therein — is what is needed to reform the state enterprises under his charge. The Water and Sewerage Authority (WASA) in particular, has become the focus of efforts. “I recently met with the management of WASA. We talked about leadership and culture and there is a bad culture at WASA. I explained to them that fixing a culture starts with fixing the leadership,” Le Hunte said. He said many leaders talk about the culture of their organisations, not realising that they are the owners and drivers of that culture. “In fixing WASA, we have to fix the leadership, decide on the culture and align the management to that culture. Management then has to lead the execution of that culture,” he said. This leadership vacuum is not just applicable to WASA, though, Le Hunte stressed, but prevails among several organisations and leaders in the country. If, then, there is to be a “paradigm change” — the government’s clarion sounded in the 2018 Budget Statement — then people need to overcome the cultural handicap of pointing fingers and changing topics and instead take a personal responsibility to step up to the plate and lead. “In Trinidad, all problems end up pointing to the Prime Minister. Trinidad needs to change so we point to the Prime Minister — we need leadership! Do you really believe that a Prime Minister giving leadership will solve this problem? We create this (idea) of a super leader who will wave a wand and solve all the problems, but we are all leaders." Change, then, starts with leaders and influencers accepting their roles and considering ways to improve, otherwise transformation will not happen, he said. Leading by example has been Le Hunte’s modus operandi from youth. During his time at Presentation College, San Fernando, he was part of the Junior Chamber, whose motto, Service to Humanity Is the Best Work of Life, inspired his trajectory. At the University of Western Ontario, where he studied Economics, he was the head of the Caribbean Association. At 26, he was appointed to the Board of directors of the National Flour Mills — one of its youngest directors. His ministerial/Senate portfolio also isn’t his first foray into politics — he once served as an Alderman on the San Fernando City Council. 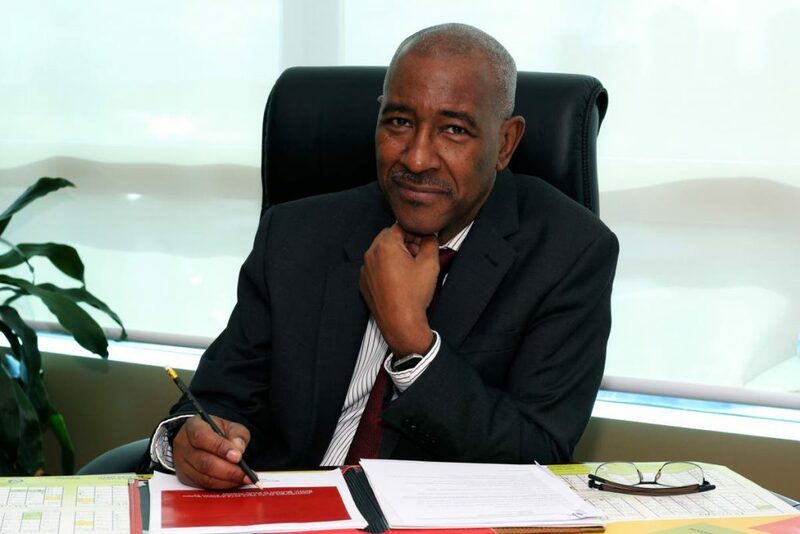 But Le Hunte is most well-known as a former executive director of Republic Bank Ltd, where he spearheaded the bank’s thrust into new markets, notably its acquisition of HFC Bank in Ghana. It was because of his management of the transaction that Le Hunte was afforded the opportunity by the Government of Ghana to take Ghanaian citizenship. 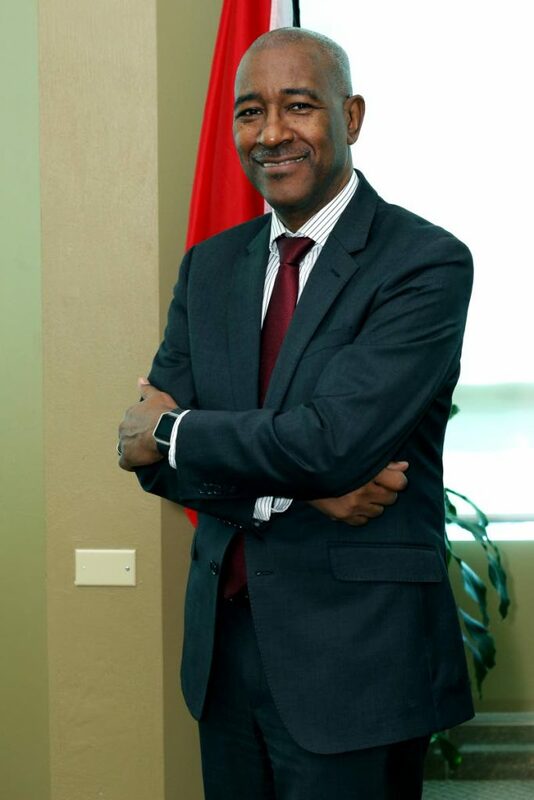 He was briefly sworn in as Minister of Public Utilities on August 24, with his position being rescinded on August 28, and then sworn in again on September 15, after he had initially failed to renounce his Ghanaian citizenship — something he described as an “oversight” stemming from his hasty relocation from Africa to Trinidad and Tobago. 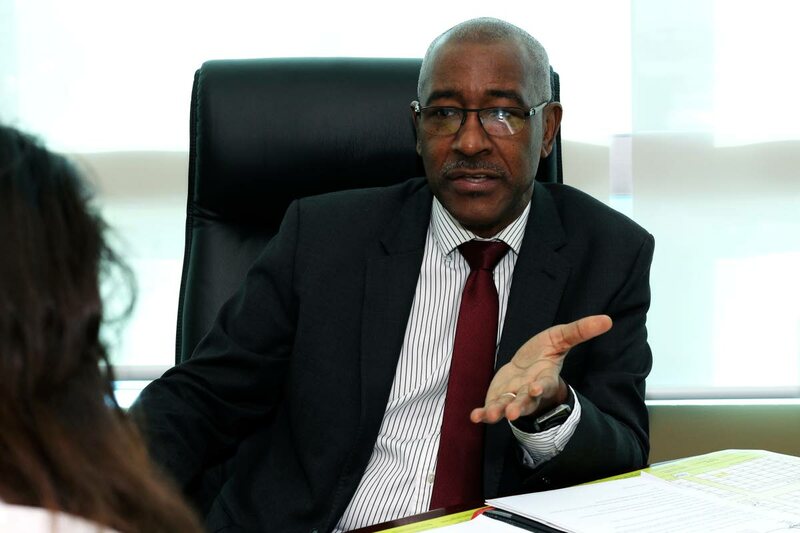 Le Hunte understands that running a State enterprise is not the same as running a bank, but he believes his experience in the private sector has ably prepared him for the challenges of running a Ministry. He also believes in setting targets and working to achieve them. “For WASA we have very clear, specific goals. Our target is reducing the loss of non-revenue water, that is, stopping leaks,” he said. In the short-term, then, his primary objective is to reduce the number of leaks, thus improving the supply of water to citizens. WASA estimates nearly 50 to 60 per cent of the 240 million gallons of water it produces is lost to leaks. Fixing leaks is the simplest way to improve WASA’s efficiency, Le Hunte said, and more cost-effective than drilling a new well or constructing a desalination plant. About 2,000 leaks have been reported across the country; his goal is to have that down to just 200 by the end of the year. Already, he noted, in the northwest, where demand for water outstrips supply by some 20 million gallons per day, over 300 leaks have been reported, but since the Authority’s new and aggressive repair campaign that has been reduced to 150. Changing the culture of WASA is imperative to achieving efficiency, Le Hunte notes, something that is paramount as it seeks to wean itself from billion-dollar subsidies that the Government can no longer afford as the country deals with economic constraints. WASA’s subsidy is $2.5 billion annually. That subsidy represents the shortfall between expenditure and revenue, where the Government fills the gap. WASA’s sole source of revenue comes from selling water and residential water rates in Trinidad are the lowest in the region — just about $2 per cubic litre. The last time WASA’s rates were increased was 1993 — using data from 1989. The Regulated Industries Commission is currently undertaking a rate review for the utility. Contractors are a particular drain on the Authority. WASA has more than enough staff to do the work for which it has previously paid contractors, including fixing leaks and facilities maintenance, Le Hunte said. “We have to increase the revenue and reduce the expenditure via contractors. I have to get WASA workers to do the work of the contractors, so I have to increase productivity,” he said. To get increased productivity — and quality assurance — closer supervision is also needed. “It was brought to my attention that when WASA assumed these leaks were being adequately repaired; they were not. That’s why they kept happening. Other times work that was supposed to be done was not. So, part of the way to fix WASA is to get your own people to do the work and supervise them better to make sure it gets done,” he said. Effective management of leak repair will ultimately help the Authority deal with another cost — the delivery of water. WASA contracts are supposed to be awarded to provide water delivery to areas where it legitimately cannot deliver a pipe-borne water supply. But some contractors have circumvented the system and capitalised from it. Efficiency does not necessarily mean privatisation, Le Hunte said. The private sector has its own shortcomings, the Minister said, including cultural and efficiency issues, where some firms still depend on the government for foreign exchange, for example, or struggling to develop entrepreneurship. “I’m not knocking the private sector, because that’s where I came from. But we need a leadership revolution in Trinidad and Tobago, and we all have to match that with a level of discipline." Putting those two together, he said, will fix the public service and WASA. “It’s about the will, the leadership, the vision and the direction and tenacity to hold on to a problem and make sure that it (is resolved),” he said. Despite the now-political connotations of “paradigm shift,” Le Hunte believes that is what the country needs. “Call it whatever you want. The problem in Trinidad and Tobago has never been money. The country has gone through times when it had lots of money and times when it didn’t have any money. The problems are still there. It is about attitude, leadership, us coming together with a focused approach and wanting to make a difference. It is about everyone participating. That is why I am here because I can’t be asking everybody to play their part and step off from the fence and when I am asked I am still on the fence,” Le Hunte said. Reply to "Le Hunte to lead by example"